Manchester United's record signing Juan Mata is confident the team will become a force under manager David Moyes. United, who have not finished lower than third in the top flight since 1991, currently lie seventh. "Even before I came, things were difficult here, so I knew I wasn't coming to a side that was going to win, win and win," said Mata, 25. "But I knew that this club was going to come back and that the future was going to be bright." Moyes, who replaced Sir Alex Ferguson as manager last July, is set to miss out on Champions League qualification, with United on course for their worst season in the Premier League, a year after finishing top. 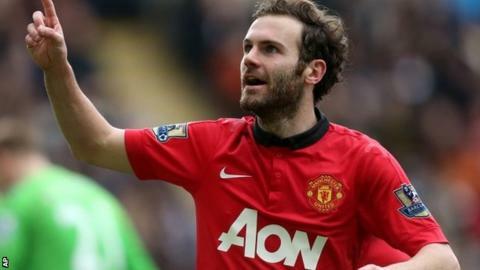 But midfielder Mata, who joined United from Chelsea in January for £37.1m, expects a number of new signings to help the manager reverse the club's fortunes. "I have no doubt about it," Mata told the Daily Mirror. "When I joined, in all my conversations with the board and the manager about next season, they were confident about getting the right players. "I'm sure this club is going to come back and fight for every trophy. "Since I was a kid, Manchester United was fighting for everything, This moment is going to come back for sure. "It's not just the manager, it's not just the tactics, it's all of us. It's not the time to blame one person. We are all together in this."